After working a half day and running home to grab some con supplies I made it to the con shortly after it opened. I usually like to use the first day to get my lay of the land and figure out where everything is. Thursday is usually the most low key of all the con days. However, this year SLCC was able to get Mark Hamill to appear for just the one day. His panel was early in the morning, and then he spent the rest of the day doing photo ops. I wasn’t able to make it to the panel, but due to this event, Thursday con floor was a bit more crowded than normal. After wandering around for a few hours, I met up with my friend Maria as she raced through the con to get to her photo op with Arthur Darvill (which she unfortunately missed). A little saddened, we went over to Arthur’s table and we were able to talk to him for a couple minutes and get an autograph. Not the same as getting his photo op, but he was kind and gracious and very British. Before my friend had arrived, I had wandered into the line of Billy Boyd’s booth and realized that it was moving kind of slow. As I looked at the booth, I noticed that he was not only doing autographs but also selfies. Having loved him in Lord of the Rings, I had called my best friend and she convinced me to take a picture with him. Once we had finished with Arthur’s table, we wandered over to Billy’s and stood in line for his picture. Let me just say, Billy Boyd… IS AMAZING! Not only is he super sweet and nice, but most celebrities that I’ve done selfies with usually only do one picture… BILLY took like 30! After being utterly charmed by Billy Boyd, I convinced Maria to come to his panel shortly thereafter. Again, I can not express how amazing this man is. His panel was one of the best panels I’ve ever gone to. Not only did he sing THREE songs (End of Night, The Last Goodbye, and Hit Me Baby One More Time), but he called Dominic Monaghan on speaker phone and asked him if he thought the Hobbits brushed their teeth after each meal. It was a great way to end the first day of con. 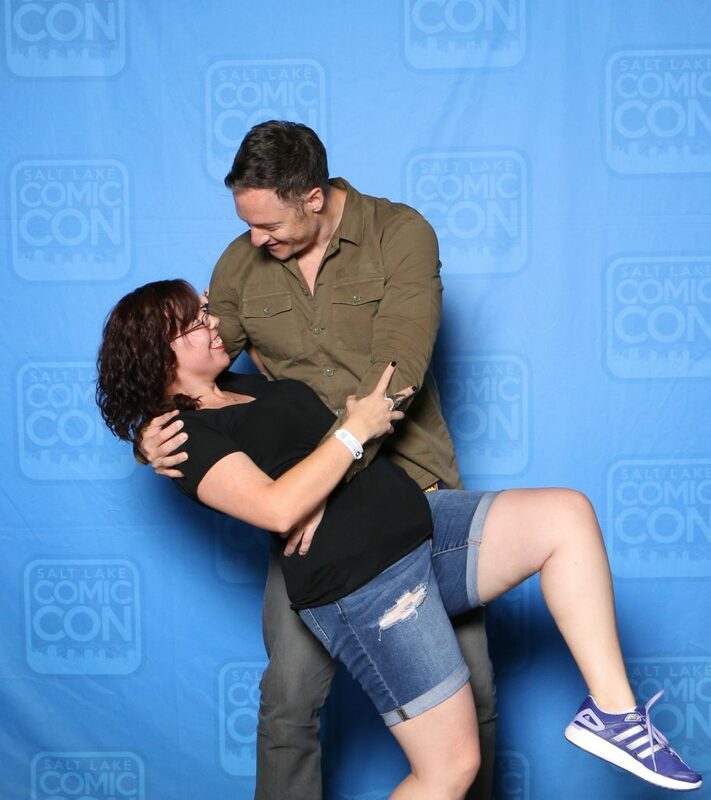 One of my main draws to SLCC this year was that Tahmoh Penikett was a guest. I enjoyed him in Dollhouse, but fell hard for him as Battlestar’s Karl “Helo” Agathon. As I was once again going solo this day, I wanted to get to his panel first thing that morning. I got there shortly before they opened the doors to start the panel and I managed to get a second row seat! The greatest thing about going to cons is the immediate friendships you can make with people. Whether you make them standing in line for a photo op and/or autograph, or sitting in a panel. I happened to make a friend in the Tahmoh panel (her name is Kenzi) with whom I hung out with the rest of the day. Tahmoh’s panel was great, I was actually a little surprised that there weren’t more Supernatural questions, instead a lot of people talked about his work on BSG and Dollhouse. I was also a little surprised at his candidness about Dollhouse and it’s flaws. He talked about how he processes and gets ready for a role and what helps him stay focused while he’s in a different headspace than he’d like (I’ll go more on this a bit later). Honestly, I could listen to that man read the phone book and be entertained. After Tahmoh’s panel, Kenzi and I just kind of wandered the vendor floor in search of something to do or see. We ended up at the Impala that not only housed the booth for Osric, but also for The Hillywood Show. The Hillywood Girls have been here before, but I hadn’t really discovered them yet and so didn’t go to their panel. THAT WAS NOT THE CASE THIS YEAR!! Not only are these girls hella talented when it comes to their parodies (seriously, the Supernatural and recently release Sherlock ones are THE BEEEEEST! ), they are also so amazing to their fans.I discovered this most during their panel in the middle of the day. The girls are so sweet and played three of their parodies. After meeting Hillywood, we bounced on over to Osric Chau’s panel. This panel filled up pretty fast, but we lucked out and got some pretty decent seats. Osric was incredible and so uplifting. His outlook on life is one of the most positive I’ve seen and it was infectious in the panel room. My favorite part was his glorious recounting of how he caught a Snorlax in Hawaii recently. He was so proud of himself! There was an awesome amount of Supernatural guests at this year’s con. For this, I’m super thankful. After wandering the floor for a bit more, we made our way to Ruth Connell’s panel. Ruth was so much fun, she had so much nervous energy she just ended up circling the panel room while we asked her questions. In addition to answering our questions, and making conversation about the babies in the audience, she also handed out stolen (possibly) hotel toiletries to those who asked questions. It was the cutest. She spoke about pranks (seems to be a common theme in all the Supernatural panels I’ve gone to) and what it was like being Mark Sheppard’s mother. It was now time for my first photo op of the con. I’ve been trying to keep my photo ops to a minimum lately, this makes the con much more enjoyable since I’m not forced to be standing in lines for hours upon hours. 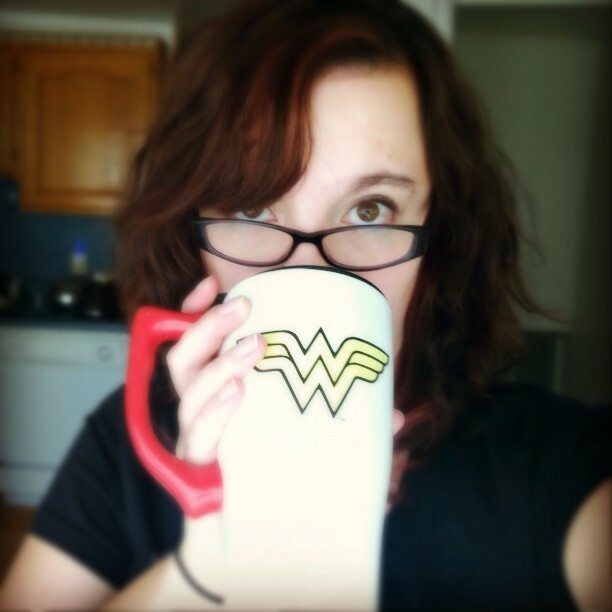 I had been racking my brain for ideas on what to do in my photo op with Tahmoh Penikett. 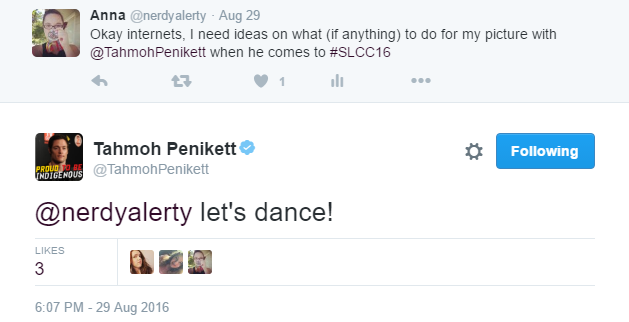 So I reached out to twitter a few days before the con asking for ideas. Lucky for me, Tahmoh himself responded. Since he suggested it, I went with it. I asked him to dip me. After looking at me a bit weird first, the picture ultimately turned out pretty great! After the picture was taken, Tahmoh double checked with the photographer that my face was shown and that the picture was okay. I’ve never had someone do that, but I was so grateful he did. 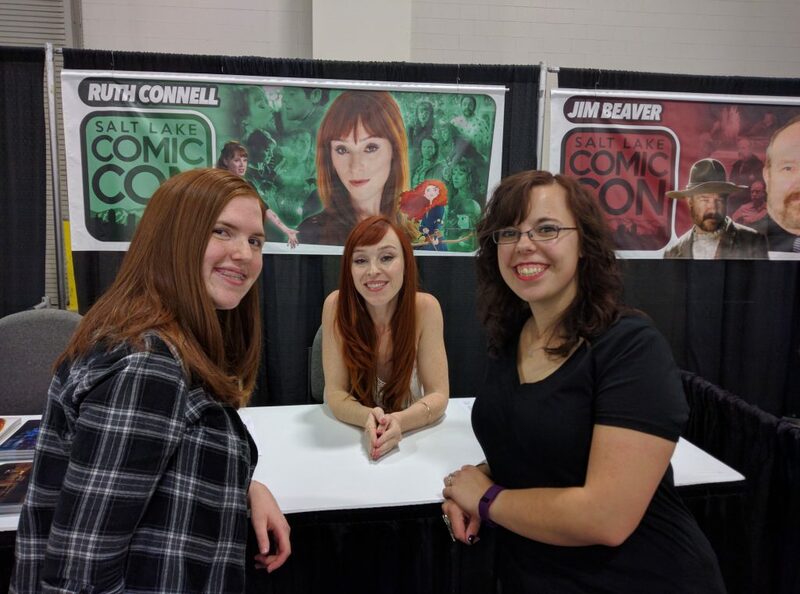 We ventured over to some booths afterward, Kenzi got her picture taken with Osric, and I got an autograph and selfie with Tahmoh, as well as a selfie with Ruth Connell. I was so impressed with all the guests they brought this year, all of them were so nice and gracious. Day three is always the most hectic. It was made a little more hectic by the fact that my best friend and I were surprising my 4 year old nephew (her son) with meeting and getting a picture with Stephen Amell (he loves Arrow and told Stephen that he plays Arrow at home). All he knew was that he was spending the day with his mom and me. 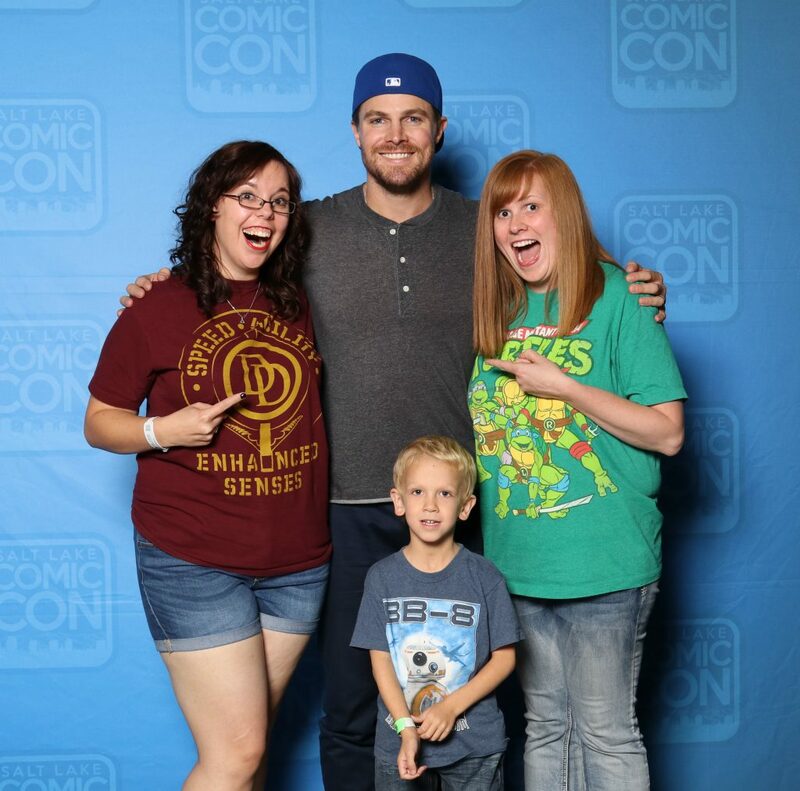 We got to the con shortly after the doors had opened, once Meghan had picked up her wrist band we headed immediately toward Stephen Amell’s booth. We wanted my nephew to meet him before we did the photo op hopefully to decrease any shyness he might have. That was not something we actually needed to worry about, as my nephew said more words to Stephen upon our meeting than Meghan and I did combined. The two of us were so flabbergasted we could hardly string two sentences together, but my nephew could not WAIT to tell Arrow that he plays Arrow at his home. It’s fun to be in the audience when things like that happen. The panel was rough for my nephew as he was getting a little antsy, so afterward, we wandered the floor to exhaust him a bit and see more things that were available. Meghan wanted some selfies with Billy Boyd (I talked him up a lot… like a LOT), and was not disappointed. I then met up with a couple of my girls from work to fawn over Ian Somerhalder (who was a SAINT in pulling double photo op duty when Paul Wesley got sick), and before we knew it, it was time for our photo op! Photo ops for the “higher caliber” guests are always a nightmare. Mostly, I go into photo ops assuming it’s going to be crazy, and usually I’m right. Stephen Amell’s was no different. Though I do feel that the photo ops moved a lot smoother than normal, they are and always will be insane. Meghan and I debated on what we wanted to in our photo op, and settled for us just pointing at him and grinning like idiots that he was standing right next to us. It turned out pretty well if I do say so myself (we forgot to tell my nephew to smile). Finally we could relax and my nephew could get out some more energy before our last event, an impromptu panel with Jim Beaver, Tahmoh Penikett, Osric Chau and Ruth Connell. They were such fun and Jim was a HOOT, I think he’s probably tired of a lot of the same question (what pranks did you pull or get pulled on you? what’s your favorite episode? will you please say “Idjits”? and the like) but I’m thinking the repeating questions probably comes with the territory. The greatest story to come out of this was the story of how Osric got the nickname “Master Chau”, and boy did Tahmoh have a fun time telling that story! The panel ended with a secret meet and greet and sign, I was able to go up to the table and get Tahmoh’s autograph once again (what can I say, I’m obsessed), and he remembered me! He thanked me for coming back and I was once again speechless. While a lot didn’t happen that day, it was much more exhausting than I anticipated. I know a lot of cons happened last weekend, did you go to any? How was it?